The Ministry of Economy and Finance was off to a rocky start Monday, as it faced mounting pressure with the delayed passage of next year’s state budget while its new minister nominee is set to have his confirmation hearing Tuesday. A concern for the ministry is that Minister nominee Hong Nam-ki could take office without a fixed budget plan, which could weaken the momentum of the government’s economic policies. The budget bill remained pending on Monday afternoon, with opposition parties vetoing the plenary session to vote on the government’s 470.5 trillion won ($421.8 billion) budget proposal. 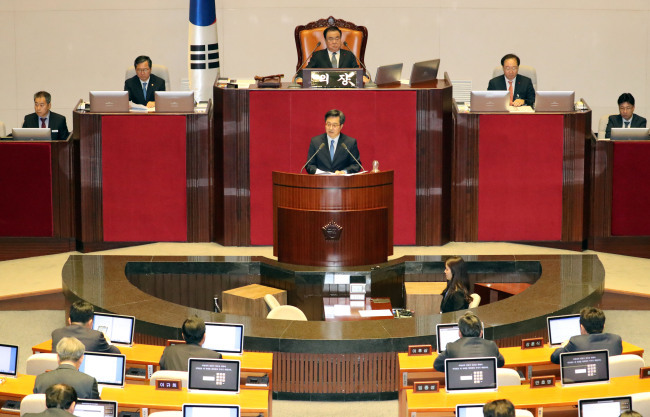 The ruling Democratic Party of Korea held the plenary session on its own at 5 p.m. to put the bill to a vote and to hear Deputy Prime Minister and Finance Minister Kim Dong-yeon’s proposal speech. Members of the main opposition Liberty Korea Party and the minor Bareunmirae Party did not attend. Parliamentary Speaker Moon Hee-sang earlier warned that he would put the budget bill to a vote, should the rival parties fail to reach an agreement by 2 p.m. via informal talks. The original budget bill put forward by the government was handed over to the parliamentary plenary session as it exceeded the legal timeline Sunday, due to partisan conflict. At the heart of the dispute has been the Moon Jae-in administration’s expanded job-related budget, including the job creation budget, which was raised to 23.5 trillion won, up 22 percent from this year’s 19.2 trillion won. While the ruling party and government have been asking for the swift passage of the bill, viewing the increased expenditure as a vital tool to revitalize the nation’s economy, the conservative-leaning opposition has been demanding an extended timeline. The Assembly’s 100-day session is set to end Sunday. Amid the brawl over the budget bill, pressure on the ministry appears to be mounting. On Monday afternoon, there were media reports of an official with the ministry’s budget office, who was rushed to an emergency room at around 2 a.m. upon suffering a cerebral hemorrhage. The reports said the official appears to have taken ill due to overwork. “The official was on standby to respond to lawmakers’ call for additional data or the review concerning the budget bill,” said an official. Meanwhile, the Economy and Finance Ministry is also on alert due to the confirmation hearing of Deputy Prime Minister and Finance Minister nominee Hong Nam-ki slated for Tuesday. Even if Hong gets through the confirmation hearing without major setbacks, a delayed budget may hamper the government’s economic initiatives, with signs of an economic slump increasingly weighing down on the popularity of the Moon Jae-in administration. As Asia’s fourth-largest economy has been facing mounting pressure, amid slow growth, sluggish employment and widening income inequality, any policy distraction for the incoming top fiscal policymaker could become a serious problem for the Moon government’s economic blueprint. Incumbent Minister Kim, who has just returned from his Group of 20 Summit visit to Argentina, visited the National Assembly on Monday afternoon to meet with party leaders over the budget.